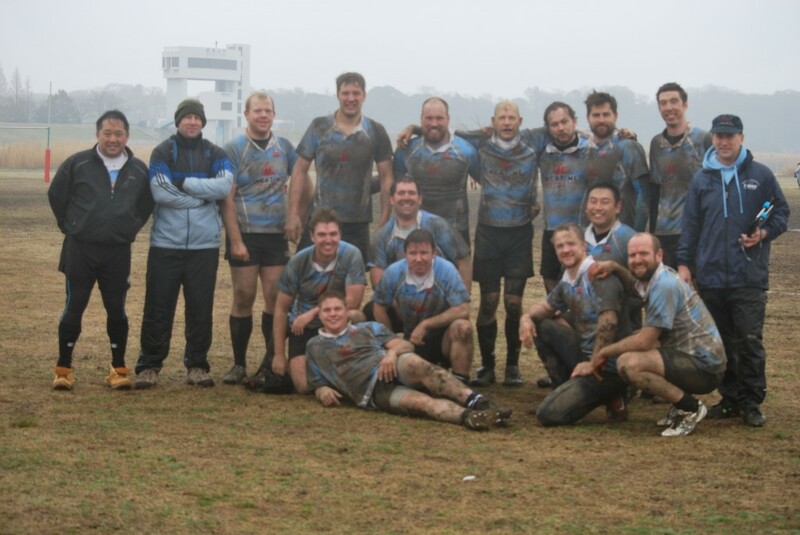 Sunday’s match against a very keen and determined Setagaya RFC could be described in many ways, but I think the most descriptive word would be “COLD”, with “muddy” coming in a distant, but by no means insignificant second. More or less on time (for a change), 19 players, one medical assistant and two hearty supporters (Brandon Fought’s parents visiting from the US) turned up in Shin-Shibamata at 09:30, most still surprised that the game had not been cancelled due to inclement weather. It was hard-going from the start, everyone struggling to even get through the warmups, much less take the pitch. But duty called, and take the pitch we did. Being the second game of the day on that particular pitch, the natural surface was already well-churned up for our pleasure – or disdain, depending on your point of view. Things were off to a great start from the kickoff, with Seth Robson running a cracking angle and breaking through tacklers to touch the ball down only three minutes into the game. After a successful conversion by Evan Hitchman, Seth returned for an encore, scoring his second try only four minutes later. Evan’s conversion made the score 14-0. The next try took a bit longer, after some great ball retention and recycling by the forwards but a visiting Tom Ball, filling in for a shortage in the backs, scored his first of three tries on the day just eight minutes later. Travis and Tom were superb all day in the backline, running some great angles of attack and mesmerizing the defenders at every turn. Tom’s next two tries over the following 25 minutes and another conversion by Evan saw the halftime score 31-0 to the Cru. Despite the amount of running we did in the first half, the halftime consensus seemed to be that we wanted to shorten halftime so that we could continue running to keep warm. The scrums, which are normally a source of warmth in cold weather, only added to the forwards misery, as everyone was well-coated in slick mud. However, that didn’t stop the pack from doing a great job in the set-pieces, nor from providing great support to the backs and providing good ball retention. Setagaya opened the scoring in the second half 4 minutes after the start, but that would prove to be the last time they came anywhere near the try line. The Cru struck back 6 minutes later with a try down the wing by Jackie Wilson. Another six minutes later and it was Roy Yorke’s turn to add 5 points to the score. Alex Diaz was superb all day in the lineouts, not to mention taking (I think) every restart in the first half. It really paid off 25 into the second half when, on a lineout 5 meters from our try line, the Cru pushed over the line to be touched down at the back of the maul by Sean Gibson. Evan’s brilliant conversion made the score 48-5. The final try of the match was scored by Frank Saffery on an unlikely 40-meter sprint by the big man. Personally, I don’t think I’ve ever seen a giraffe gallop, but now I think I have a pretty good idea what it would look like. Successful conversion by Evan Hitchman and the score was 55-5, where it remained until the final whistle 4 minutes later. Adding to the day’s fun, the ground on which we played had no facilities, so we had the pleasure of moving on to the pub whilst caked in mud. The good news, however, was that it was too bloody cold to sweat. So we didn’t smell as bad as we would have if we had been playing in, say, above-freezing temperature. So, on to our semi-regular standing bar near Koiwa station, where the waitress has forced me to re-examine my slight aversion to tall girls, for a few (read: many) beers. I have vague memories of a train ride at some point after that but details fail to come to me. In summary, a great win and a great (albeit COLD) day for the Cru. There was some great teamwork exhibited and Setagaya RFC, despite the score, gave us some very determined and spirited opposition to make the game that much more enjoyable. Thanks to all those who came out, players and supporters, to endure the arctic conditions. Looking forward to the next one.